"A melodica is a free-reed instrument that creates musical notes when air is blown through the mouthpiece and keys are pressed. A melodica looks similar to a miniature keyboard but works more like a clarinet. When you blow through the mouth piece, you press keys that open up holes for air to flow over a reed which is what creates the notes. Melodicas are great for getting people into music as they are rather easy to play. You can even add a tube to blow through which allows for the user to play the keys with two hands rather than one and also see the keys at the same time. This is great for learning. " If you’re brand new to the world of melodicas, this basic Andoer model is the perfect option to get your feet wet without spending too much or worrying about the fancy options that come with other melodicas. This little guy is one of the most affordable melodicas out there – they don’t get too expensive, but Andoer really outdid themselves with the pricing on this one. And for that affordable price, you get everything you could want out of a basic melodica: 32 keys, two different mouthpieces (short and long), a carry bag, and great construction quality. With this one I really do like how they include both a short and a long mouthpiece – if you’re new to the instrument, it’s a great way to try out both methods of playing it. With the short mouthpiece, you can hold the instrument up while playing. 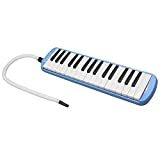 The long one allows you to set the melodica down on a table while playing so you don’t have to hold it up the whole time. The Hammond 44 comes with a hefty price tag, but is hands down the classiest, most well-constructed melodica on the market. It was made in conjunction with Suzuki Instruments’ world-renowned harmonica technology, so it’s much more of a “real” instrument than other budget melodicas can ever be. The sound is incredibly full and rich, and the included internal microphone means you can fit right in with any band up on stage without getting drowned out while playing. If you’re serious about your melodica playing, you absolutely will not be disappointed with this Hammond 44. Everything about it oozes “premium,” and the performance of the instrument surpasses even its great looks and feel. Hohner calls themselves an industry leader in melodicas (as their original Piano 36 melodicals were made in Germany decades ago) and after trying out this Performer 37 I have to agree. This model features 37 keys (tone range from F to F, through middle C) and bronze reeds, and ships with a carrying case, a short mouthpiece that fits directly into the instrument, and a longer, flexible hose mouthpiece addition that enables you to set the instrument down on a table or your lap while you play. I was quite impressed with the breadth and richness of the sound you can get out of this Hohner after acclimating to the instrument for a few minutes. You can tell it’s a true Hohner in line with their renowned harmonicas just by the sheer quality of its pitch and tone. The 37 keys are fantastic as well, and really seem any 32 key melodicas seem a bit sparse in comparison. This 37 key model from D’Luca is one of the few 37 key melodicas you can get at such a reasonable price. And don’t get me wrong, D’Luca does not slack on the quality here either. I’ve been extremely impressed with the overall construction and presentation of this instrument given how affordable it is when compared to some of the more expensive options out there. As is standard, the M37 ships with a zippered carrying case as well as two mouthpieces – one short, one long & tubed. A big note here is that you can get the instrument in black, blue, red, or pink. This is a welcome sight in a world where most melodicas ship in the standard matte black, with no other options to be found. Personally I opted for the blue version, and I’m quite pleased with the richness of the coloring. From a performance point of view, I do think this is an excellent “beginner” melodica of sorts. You’ll never get the highest quality tuning and pitch capabilities out of a budget instrument, but there really aren’t any glaring issues to be found with this D’Luca. It’s always encouraging to come across the Yamaha brand when instrument-shopping, and this 37 key melodica by Yamaha is no exception to that rule. The instrument itself is nothing short of beautiful, from the texture and weight to the rich almost-mahogany color of the case and chassis. Yamaha does not make crappy instruments and this melodica is one of the most well-constructed, well-presented melodicas I’ve ever come across. When I got mine in and started playing, I was actually mesmerized by how rich and vibrant the sound is. It’s simply a joy to play away on this P37D, and I’m once again impressed at the consistent level of quality that Yamaha maintains in all that they do. This melodica does ship with a case as well as both a short and long mouthpiece, and the case itself actually features a really cool built-in storage slot for the mouthpieces – you can tuck both away inside, close up the case, and be on your way with the entire instrument and all peripherals contained within. A melodica is a free-reed instrument that creates musical notes when air is blown through the mouthpiece and keys are pressed. A melodica looks similar to a miniature keyboard but works more like a clarinet. When you blow through the mouth piece, you press keys that open up holes for air to flow over a reed which is what creates the notes. Melodicas are great for getting people into music as they are rather easy to play. You can even add a tube to blow through which allows for the user to play the keys with two hands rather than one and also see the keys at the same time. This is great for learning. Melodicas can be found in a variety of different classifications. They are as follows. Soprano and Alto- Offer high pitched, thin sounding notes. These Melodicas are often played with 2 hands. Alto are the most common and often considered the easiest to play. Tenor- Tenors offer a lower pitch and are often played with 1 hand while the other holds the melodica. This is where the tube mentioned above comes in as you can also play them with two hands, while blowing through a tube and the instrument is on a flat surface. Bass- Bass is the lowest pitch melodica and also the rarest. It is as you could probably guess, used for bass tones. Accordina: This is where the keys are replaced with buttons. They are often made of metal but some cheaper ones can be found made of plastic. Here is where I describe what you should be looking for in a melodica. Remember that these are mostly tips to help beginners, so if you know what you want, do not stray from your path. Take in the advice and make a decision that is right for you. Key Count- The amount of keys on the instrument will obviously decide how many notes and octaves that you can play. Typically, a professional melodica will have about 37 keys. 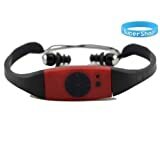 This is a great range however, you may find that you do not need quite that many. 32 keys is a good amount for someone who wants a more compact design and that is easier to hold for long periods of time. Key Quality- Key quality is one of the most important things to look at when buying a melodica. This is because you want very consistent “pushes” so that the key gets full pressed every time. Some cheaper melodicas will feature very light feeling keys that are inconsistent across the range. Make sure that the melodica you buy will have a consistent feeling across the keys as well as a bit of a weighted feeling. You will be able to tell quality keys as soon as you press them. Seal– You want to ensure that the melodica you buy features a seal that is tight to prevent leakiness. The only time air should escape is when you open the spit hole. Some say you can fix a leaky seal with food grade silicon but it is better to buy an instrument that has a good seal to start with. Weight- Weight is a hard thing to judge with melodicas as there are advantages to both sides. Yes, a lighter melodica will of course be nicer to hold, especially if you are playing for a longer period of time. However, there is also usually a direct correlation with weight and quality. Some instruments feature a metal tray which is heavier but also better than the plastic ones. The same goes for most other parts. A bit of heft can ensure an overall sturdier build quality. Case- This is often overlooked but is one of the most important things to consider when buying a melodica. Do not skip out on the case, it will protect your investment! Some melodicas come with cases where others do not. Just be sure that you have enough contingency in your budget to buy one if the melodica you are looking at does not come with one. There are many different types of cases so pick what works best for you lifestyle. Hand Straps- Hand straps are good to have as it helps keep the melodica in place. However, it also limits your playing angles. So if you are happy to play at one angle then we recommend one. Otherwise you may not find much use out of it. Tuning- All melodicas come factory tuned to some extent. It is important to point out though that not all of them will be “perfectly tuned” for when yours arrives and you start to play it. Sometimes you may find that the notes are a bit sharp. The best practice is to learn how to tune your melodica yourself. It is relatively easy and there are a bunch of instructions online that will teach you how to do it. Mouthpiece- The next thing you should look at is the mouth piece on the melodica. Now if you are new to the instrument then it will be hard for you to know what you like. There are a variety of different designs out there though so look around to see. It may be worth testing a few if you get the chance. Either way, the one that comes with the instrument should be good enough for learning. So overall, there is a lot to think about when purchasing a melodica! Start by choosing the right classification for you. We recommend an Alto for beginners. Next pick the number of keys you want. After that it boils down to budget and quality. Remember to have this guide handy when looking at melodicas so you can pick the right one for you. Buy a melodica that comes from a quality brand rather than an off-name that you have never heard of. This will help ensure you get the best instrument for your budget. Happy playing!